A couple of evenings ago this was my view of Brent Knoll seen from 'that hotel' many will have seen high up on the hill overlooking the M5 at Webbington in Somerset. Click HERE for a bigger and better experience! If you're a frequent listener to traffic reports, this stretch over motorway between Highbridge and Weston super Mare is often at a standstill or a sea of Hungarian trucks and caravans. Given the choice, I imagine for most supping a beer with such view would win over being stuck in the car with screaming kids or moaning backseat drivers as yet another articulated lorry slows the whole motorway down as its selfish driver tries to overtake another lorry at a 0.00000000001 MPH advantage. What's this go to do with trains? Nothing really other than it uses the technique I'll be writing about in due course for producing a photographic back drop for a model railway, and oh yes, the Highbridge branch of the beloved S&DJR used to run from left to right just beyond the hill in the distance. nevard_100810_moreton_66188_DSC_8939_web, originally uploaded by nevardmedia. Until I took this snap earlier in the week it had never dawned on me that with the construction of the 2012 Olympic Village at Bow in East London that there might not be enough room for all the waste mud and rubble generated during the building process. 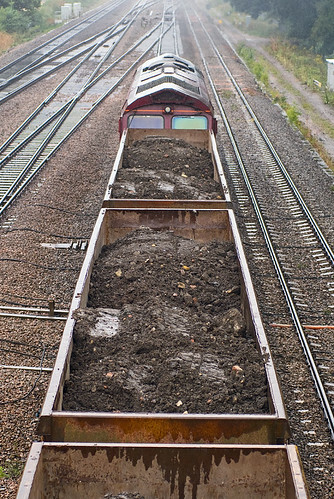 So now not only has the Cockney accent moved to most parts of the southeast and beyond, but now also some Cockney East End rubble - this London overspill in the wagons above being destined for the very well-spoken middle class Oxfordshire! If you like wagon loads for some odd reason, I've posted a few more here. nevard_100810_didcot-nth-jct_motleycrew_DSC_8837_web, originally uploaded by nevardmedia. A week of two back a date was chosen to catch up with some old pals for a nerdy day out snapping trains in the Thames Valley. Of course in this 'nanny state day and age' such innocent activity is often mistakingly seen akin to terrorism, so going on mass makes one less susceptible to attracting the wrong kind of attention from over zealous public and jobsworths. 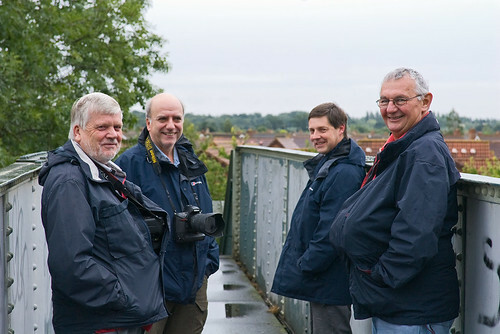 Above is the dangerous looking motley crew, I hasten to say before we all got a good soaking! With hindsight we would have chosen a better day, for we all gave up just after lunchtimes due ot the rubbish wet weather. Still, the joys of digital capture allow one to record scenes in the most inclement weather! nevard_100804_cornish-engine_IMG_7535_02_web, originally uploaded by nevardmedia. Rather than clad the Cornish Engine currently on the workbench as part of my Mendip Colliery project (posed with a bit of CGI in the form of Priddy in Somerset very near to the caver's Mecca of Swildon's Hole in fact) in embossed stone effect sheets, I wanted a more rustic random effect. There's only one way to do this, and that is to carve each stone individually using a sharp object into a surface that will take such abuse - which in this case is Humbrol Air Clay. Obviously the colour is way off, it being the native red colour of the clay - this will be addressed in due course with paints and weathering. Some of the clay crumbled a little - something that I'm quite pleased because it's part of the effect I'm after, and something that could not be done with embossed plastic. 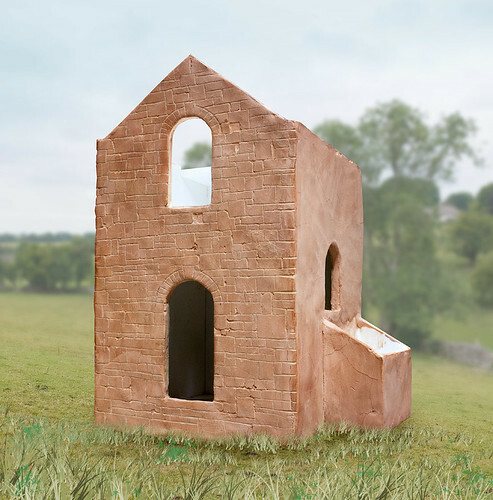 The random cracking is also a useful 'feature' of Air Clay, to further the rustic effect. nevard_100729_priddy_IMG_7522_web, originally uploaded by nevardmedia. Many railway modellers will go to enth degree to ensure that their flanges are to the correct scale, yet they still model their landscape with grass no taller than what might be seen on a top of a golf course. I'm not quite sure why this is, I hazzard a guess it's because many of them are so flange obsessed they don't have time to look at the real world or are so short sighted due to all that flange gawping they literally cannot see it due to damaged eyesight. 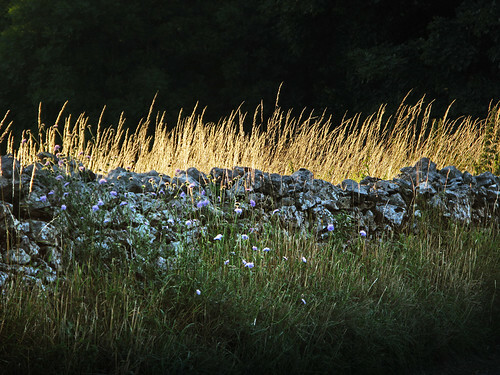 This snap; another taken in the delightful Somerset village of Priddy high up in the Mendips shows tall summer grasses backlit by the evening sun, the height of which must be getting on for 5 or so feet tall (that's 20mm in 1/76th scale land!!). Of course, those flangists would never model anything so tall because you never see such in real life do you? Please note; not all flangists are totally ignorant (some of them are quite decent and I even have the odd one or two as good friends), just there are enough of the other ones out there for me to have a harmless poke at as well as giving me an excuse to write some drivel to introduce the above photo. nevard_100731_priddy_DSC_8757_web, originally uploaded by nevardmedia. Over the weekend we took our tent down to Priddy high up in the Mendip Hills. 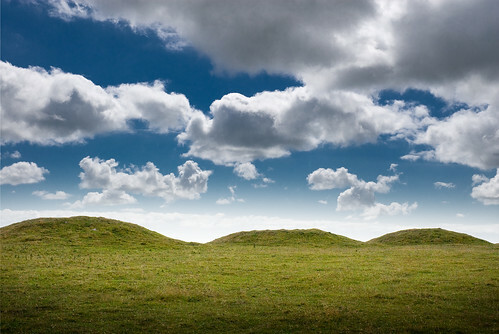 On one of our walks to various watering holes we climbed past the bronze age Ashen Hill Barrows a dash under 1000 feet up a mile or so north of Priddy. This is the result 2 RAW transfers of the same image combined, one optimised for the sky and the other for the foreground. In the old days we'd have shot in black and white and used a red filter, or if in colour used one of those dreaded Kokin graduated filters and maybe a polarzing filter to separate the blue sky from the clouds.